Just how affordable are your used pallet racks? Savings can range between 40-60% on used pallet racks—a very affordable option for companies who need functionality and have little concern about appearance. Facilities that are seldom, if ever, visited by corporate management or clients do not have to worry about the appearance of a pallet rack so long as it holds up and does its job. Facilities that depend on appearance for sales, investment, or management approval can find very affordable new pallet racking that can be custom built for special storage and minimal installation cost. How do you build a rack with special storage in mind? Well, for one thing, palletized materials do not always need a deck to support them. If the exact measurements of the pallets are known in advance, and if uniformity of pallet size is certain, it is much more affordable to build a pallet rack with only beams and uprights. The viability of such a system does, however, depend on what you intend to store on the system and how much total weight will be placed on the beams. Let a pallet rack specialist help you with these calculations. How can a pallet rack make installation more affordable? Certain pallet rack designs allow for rapid, easy assembly. The teardrop pallet rack is the fastest and most affordable type of rack to assemble in terms of labor and man hour costs. Because it requires no braces, bolts, or brackets to assemble, all the installation team has to do is snap the beams, uprights, and decking (if present) into place. This saves a great deal of money and time and shaves the total cost of procurement down considerably. Is there anything else that can make a used pallet rack more affordable? 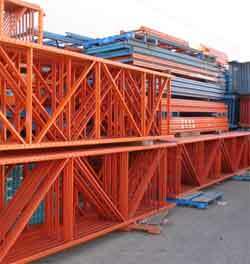 Used pallet racking are an excellent tool for recession proofing both inventory control and shipping/receiving. By making better use of space and making it easier to manage and move materials, the improved efficiency they bring to a rail yard, factory, warehouse, sea port, or construction site is undeniable. This translates to return on investment on multiple levels. It minimizes, if not completely eliminates, the need to move to another facility. Better organization of materials makes inventory tracking and purchasing much more accurate. Safer working conditions normally result, which in turn reduces liability and possibly qualifies an organization for better general liability insurance rates (depending on the carrier, agency, industry you are in, and where you are located, of course.) Better control of materials also means less damage to materials themselves, and less time retrieving and storing items due to customized, affordable pallet racks that can be built for either hand access, forklift access, or both.